"Can't Help Falling in Love" is a song recorded by Elvis Presley for the album Blue Hawaii (1961). It was written by Hugo Peretti, Luigi Creatore, and George David Weiss. 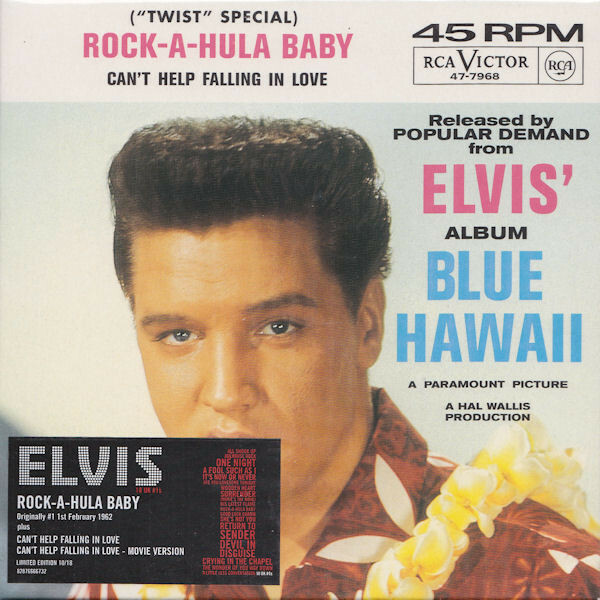 "Can't Help Falling in Love" was featured in Presley's 1961 film, Blue Hawaii. (The melody is based on "Plaisir d'amour", a popular romance composed in 1784 by Jean-Paul-Égide Martini). Elvis Presley's version of the song topped the British charts in 1962. During Presley's late 1960s and 1970s live performances, the song was performed as the show's finale. Most notably, it was also sung in the live segment of his 1968 NBC television special, and as the closer for his 1973 Global telecast, Aloha from Hawaii. A version with a faster arrangement was the closing number in Presley's final TV special, Elvis in Concert. "Can't Help Falling in Love" was also the last song he performed live, at his concert in Indianapolis at Market Square Arena on 26 June 1977. 29.06.85 Paris, France, intro to "Can’t Help Falling in Love with You"
"Oh, I would like to take a moment and thank everyone for coming to the show here in Paris, thank you , we appreciate it and, uh…I’d also like to thank you for your support of our band over the years when we haven’t gotten over here as much as we’d liked.I want you to know we appreciate it…this, uh …this next song…last time, it was in 1981 when we played here… and I think we, we did this song for the first time but uh…what happened was, uh, in ’75 we were on tour in the United States, on the “Born to Run”-tour and…I guess I was about 26 years old, we were in Memphis, Tennesee…we played in a small auditorium and that night I called a cab driver and I got him to take me out to Elvis’ house and, uh, it was about 3.30 in the morning, I got out there, I got out of the cab and I stood outside the gates and I could see a light on in the second story window…and I jumped up over the wall and I ran up the driveway towards the house…and I…I got to the front door – I got, I think it’s a stupid thing to do now ‘cause I hate it when people do it at my house but but but I got up to the front door and I was filled with the enthusiasm of youth and as I was about to knock, a guard came out of the woods and asked me what I wanted and I said “Is Elvis home?”…and he said “No, no, Elvis is in Lake Tahoe” and I told him that I was a guitar player too and that I had a band and I told him that, that we played in town, I told him that I had my picture on the cover of Time and Newsweek ……. I did ….. I had to pull that one out of the bag but that didn’t work, I don’t think he believed me and he took me by the arm and he put me back out onto the street where I belonged, I guess…but uh…I remember later when a friend of mine called me not too long after that and said Elvis had died, oh, it was hard to understand how somebody whose music had taken away so many people’s loneliness and who gave so many people a reason to live…could have died…seemly as lonely and as tragically as he did…anyway, I’d like to do this song for you tonight, wishing you all the longest life with the best of everything …"